Homesteading can be tough, but there are tips and tricks—hacks—for any area of the homestead that can make life a bit easier. Wikipedia defines hack as “any productivity trick, shortcut, skill, or novelty method to increase productivity and efficiency, in all walks of life; in other words, anything that solves an everyday problem in a clever or non-obvious way.” I have yet to meet a homesteader that didn’t solve daily problems in clever and non-obvious ways! We all know our soil is the lifeblood of our livelihood. Healthy soil can translate to a healthy body and a healthy wallet. Understanding the structure of your soil will help you decide what soil amendments you need and what plants you will be successful with. Soil Structure Test: To understand the structure of your soil, fill a quart-sized Mason jar half full with soil from your garden bed. Top with water, leaving enough room to shake it up. Cap tightly and shake for a few minutes. Set the jar aside for a few hours and allow the particles to settle. When examining the results of this soil test, you will notice the particles have separated into three layers. The bottom layer is made up of sand and rocks. The next layer is silt. Above that is a layer of clay. Anything floating on top of the water is organic matter. If your jar contains 20% clay, 40% silt, and 40% sand you have loam. Congratulations! Loam is considered to be the ideal gardening soil. 30% clay, 60% silt, and 10% sand is silty clay loam. Soils heavy in clay drain slow and is the slowest to warm up in the spring. 15% clay, 20% silt, and 65% sand is sandy loam. Sandy soil drains water and nutrients away from the plant roots very quickly. D.I.Y Seed Tape: Planting tiny seeds is fairly simple if you can be ruthless about thinning them out once they germinate. I always feel like I am wasting not only time and effort, but potential food and market income when I thin out a garden bed. Seed tapes are a way to solve this problem, but they are expensive in stores. Fortunately, you can make your own seed tape with something almost everyone always has on hand: toilet paper. To do this, cut toilet paper to the length of your garden row. Make a paste using one part flour to three parts water. Put a dot of paste every 2 inches down the middle of the length of toilet paper. Place two or three seeds on each dot of paste. Let dry. You can either roll this up for storage or plant. To plant, set in garden row and cover with dirt. Early Planting: If you have seeds you are anxious to plant, or seedlings ready to be transplanted before the soil has warmed up, you can warm the garden bed up yourself with this easy and inexpensive trick. All you need to do is lay some black plastic sheeting, or heavy-duty black trash bags, across the planting area. Hold the sheeting down with some bricks or large rocks. Your bed will be warm enough for gardening in a week. D.I.Y. Tomato Greenhouse: Everyone is excited about the first tomato of the season, but it is hard to get an early start on these heat-loving plants. If you want to plant tomato seedlings early, you can. Once you have them planted, put a tomato cage around the plant. Wrap the tomato cage in kitchen plastic wrap. This creates an individual greenhouse for each plant. Remember to unwrap the plant once the weather warms. Water, Don’t Flood: To ensure your plants have enough water without drowning their roots, save water bottles and plastic milk jugs. Poke holes in the bottom of the containers and bury them next to your plants. Fill the containers with water and let the water release slowly into the ground. Container Gardening: If you want to grow your own food in a small space, consider container gardening. Yes, it can be expensive if you have to buy all those pots and planters. But there is a cheaper and more efficient way. Rubbermaid containers come in all shapes and sizes. You can find one that will accommodate anything you want to grow. Drill holes in the bottom of the containers for drainage. Use the container lid as a drip pan. Fill with soil and plant to your heart’s content. Sweet Tomatoes: Love tomatoes but hate the acid? You can grow sweeter tomatoes with baking soda. Add one teaspoon of baking soda per gallon of water. Once you see a tomato, begin watering your plants with this mixture. Baking soda absorbs into soil, lowering the acidity level. The result is a sweeter tomato. Chick Waterer: If you’re lucky enough to have biddies, there is an easy way to ensure they have enough water but won’t drown. Fill a pan with water and add rocks of all sizes. The biddies can drink, but cannot fall in. Laying Box: You can buy a laying box for $10 at any farm supply store. That’s a lot of money and it cuts into any profits I hope to make from selling farm-fresh eggs at the farmer’s market. Instead, put shredded newspaper in cardboard boxes. If your boxes are off the ground, put a brick in the box as well. This will keep your box of eggs from falling. D.I.Y. Udder Butter: If you have animals you milk, udder balm is a necessity. Again, it is available at stores, but it is easy to make at home. Melt ½ ounce beeswax in a double boiler. 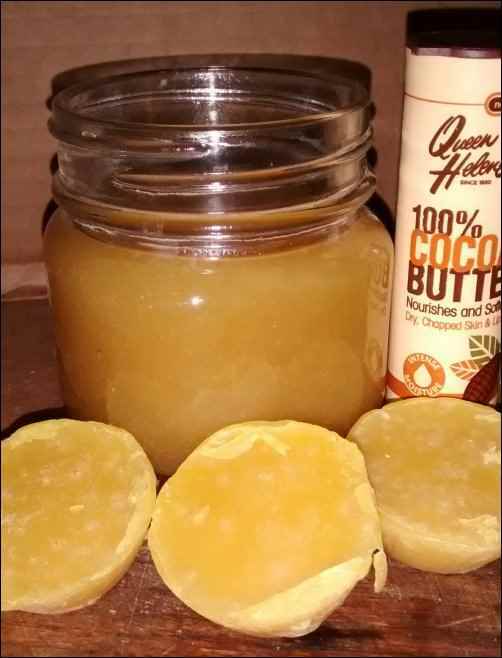 Once the beeswax is melted, add 1 ounce of shea butter or cocoa butter and 1 ounce of coconut oil. Stir to combine. Add 3 ounces of calendula-infused oil and remove from heat. If you want to add a couple drops of essential oil, add now. Store this balm in glass or plastic containers at room temperature. A bonus: udder balm is not just for udders. It is very soothing on chapped hands. To make calendula-infused oil submerge a handful of calendula leaves in olive oil. Let this mixture sit in a sunny window for a week. Shake daily. Strain the leaves out of the mixture. Store the oil in a clean jar. Brown Sugar: To solve the problem of rock-hard brown sugar, just make it as you need it. 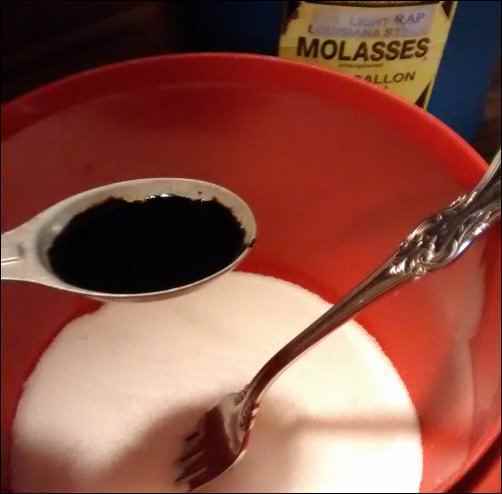 Add one tablespoon of molasses to one cup of granulated sugar. Mix with a fork until you have brown sugar. Fresh Eggs: With free-range chickens, we are sometimes surprised when we come across a hidden nest of eggs. If you have ever had the unpleasant experience of cracking a rotten egg into a skillet, you understand the importance of testing eggs for freshness. 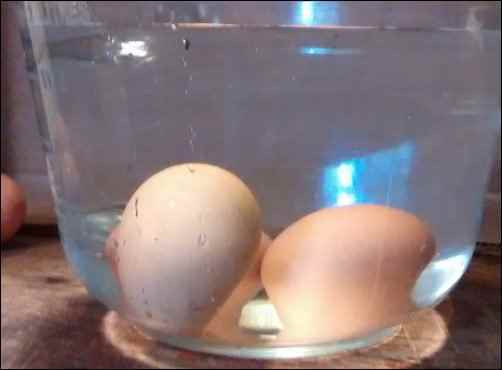 Fill a pitcher with water and gently put your eggs in the pitcher. A very fresh egg will sink to the bottom and lay on its side. If the egg sinks to the bottom but its fat end rises up slightly, your egg is about a week old. Any eggs that float are bad and should be discarded. Freezing Eggs: If you can’t eat all the eggs your yard birds give you, don’t despair. While fresh eggs will stay good for about five weeks in the refrigerator, frozen eggs will last for up to six months. To freeze your eggs, crack them into a muffin tin. Freeze until solid. Transfer to a freezer bag that you have labeled with the date and store until you are ready to use. Freezing Fresh Kale: Kale is considered a super food, loaded with vitamins and minerals. You can cook it like spinach, eat it raw in salads and on sandwiches, or add it to breakfast smoothies. If you have kale in your garden you know it is easy to grow a bumper crop. Use what you can straight out of the garden for meals, but freeze some for smoothies. To freeze fresh kale separate the leaves and remove the ribs. Soak in water to remove any dirt. Let dry on a kitchen towel. Once dry, lay kale leaves out on baking sheets in single layers and flash freeze. Once frozen, place in freezer bags. Work quickly because it begins to thaw fast. Label the bags and put back into the freezer. Pull out as much as you need at a time. D.I.Y. Cake Flour: Finally, does your baking recipe call for cake flour? It does make a difference, but cake flour is an expensive ingredient that doesn’t get used a lot. Instead of buying a bag at the grocery store, make your own. Using all-purpose flour, measure out the amount specified in the recipe. For each cup of flour, remove two tablespoons. Replace the two tablespoons of flour with two tablespoons of cornstarch. Sift. This quick hack is a beautiful and inexpensive replacement for cake flour. Homesteading doesn’t have to be difficult or expensive. Use these easy hacks, and be inspired to create homesteading hacks of your own!